Jessica LeeAnne was born August 20, 1988, and she was the most beautiful baby I’d ever laid eyes on. My middle name is “Lee” and my wife’s is “Anne,” so we combined them for her middle name, symbolizing her being part of both of us. We knew she was different from other kids when she was very young. She was extremely inquisitive, and could not learn at a fast enough pace. By the time she was two she could count to 20, knew her ABCs and all the primary and secondary colors. She was reading at age four. Yeah, that’s my babygirl. She makes me smile. She skipped a grade in elementary school and qualified for the gifted program. Jess graduated at age 16, but had no interest in continuing her education at the time. She thought she was ready to LIVE, so she hooked up with an older guy who introduced her to drugs, and then talked her into leaving home soon after that. I guess the Lord prepares my wife for grand changes of life, but I felt like I’d been ran over by a truck. I didn’t know what to say, so I just sat down on the bed and cried. We made her bedroom my son’s “game room,” to better deal with the loss, and she was gone for several months. I’d hear from her every now and again, but then she’d drift into oblivion again. If you’ve not experienced this as a parent, it’s a feeling of helplessness I wouldn’t wish on my worst enemy. But I knew eventually she’d be back. Then one day she contacted us, saying she was ready to get clean, and to come home. I felt like the sunlight had just crashed into my pitch-black dungeon, and we worked out the finances and a ride to a rehabilitation facility in Phoenix. The transition back to the real world was bumpy, sure, but my girl is strong, and once she sets her mind to something, nothing can stop her. 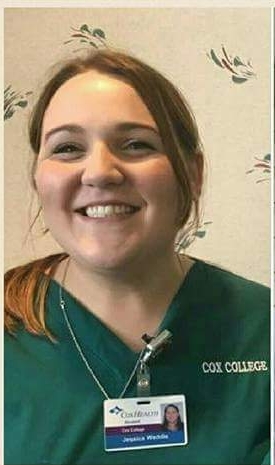 She started out working at a gas station, but soon she began to feel the longing to do more, to BE more, so she enrolled in nursing school. And, once again, she killed it. Would you believe they asked her to be a tutor after the first semester? Well, anyone who knows Jess believed it because she’s just that good. She graduated top of her class, and is now a nurse with hospice. Yep, that’s my girl. She’s unstoppable, and I couldn’t be more proud of her. “If you decide to make this leap of faith and get sober and be strong enough to break the cycle, I promise you in five years, you won’t know yourself. You will have come so far, regardless of if you decide to go to college, or focus on a career or your family. It hurts now, but the hurt will fade. If you give one-tenth of the effort into living a clean life as you did an addicted one, you will not only survive but prosper. Give yourself the time. “You are worth it! Your family is worth it. “I thank God every day my son never saw me as I was before, because I got sober before I got pregnant. But even if you have kids, it’s never too late to be the best mother, daughter, sister, etc, that you can be. There is nothing for you in addiction or abusive relationships. And you can’t change anybody except yourself. See, told ya she was smart. You’re very welcome. The world needs uplifting stories of victory in the face of seemingly insurmountable odds, and Jess beat the odds. She’s my hero. This was beautiful, Rob. I’m so thankful Jessy decided to turn her life around, and to be able to be close to her again. She is beautiful inside and out, and one of the most loving, caring people I know. I completely agree, Ashly. She is an amazing person and I’m so proud of her. Thank you guys. I really appreciate all of you and Ashly I’m so grateful you and I got to be good friends again 🙂 God truly is good! Love you all!